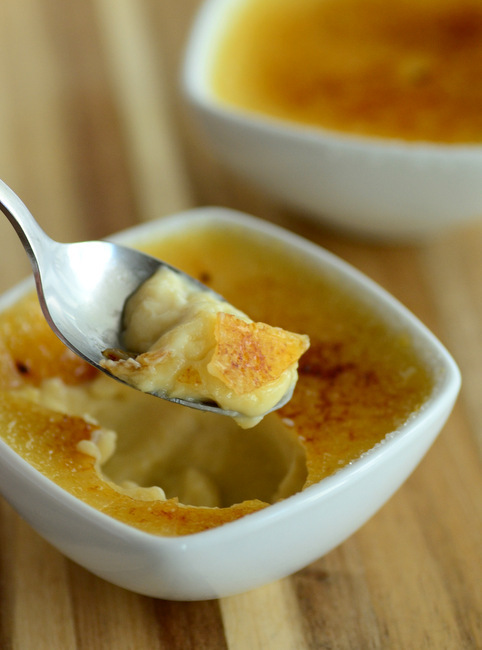 Creme brulee is a dessert that many of us only enjoy in restaurants, but the delicate custards are fun and simple to make – well worth treating yourself to a set of ramekins, so you can make them any time. This Maple Syrup Creme Brulee has a caramelized sugar crust sitting atop a silky smooth custard that is flavored with pure maple syrup. It’s not overly sweet, though it is rich in flavor, and is a fantastic way to end almost any meal. I used a combination of sugar and maple syrup in this creme brulee. I find that the relatively neutral sweetness of the sugar – along with a small pinch of salt – really helps to bring out the flavor of the maple syrup. The sugar also contributes to the overall texture of the custard in this recipe. Since you’re going to get most of the flavor from the syrup, I highly recommend using a darker maple syrup that has a stronger flavor. This was previously known as “Grade B” maple syrup, but is more commonly labeled as “Dark Amber” now. I’ve also seen some barrel aged maple syrups out there that have a wonderful flavor, too. In the end, make sure the maple syrup is pure maple syrup and has a good flavor on its own for best results. To make the custard, a both cream and milk are brought to a simmer on the stove top. I really recommend using whole milk, not low fat milk, for best results here. If you have half n’ half, you can substitute that for both the cream and milk. The sugars are added to the milk and that mixture is slowly drizzled into beaten egg yolks to temper them. This process not only helps to thicken the custard, but to ensure that the custard bakes evenly. Once the mixture has been tempered and strained to remove any lumps, it is divided into ramekins and baked in a water bath. I describe deeper ramekins in the recipe, but you can absolutely use shallower ramekins – which are more commonly used for creme brulee to maximize the sugar-to-custard ratio – if you have them, reducing the baking time by just a couple of minutes. The custards should be chilled completely after baking. I often make them the night before I intend to serve them, just to ensure that they are cold. When you’re ready to serve, top them with a generous layer of sugar (use regular sugar or baking sugar, not coarse sugar) and brulee them using a kitchen torch or the broiler in your oven. Serve them immediately after caramelizing the topping. Preheat oven to 325F. Arrange six 6-oz ramekins in a 9Ã—13-inch baking dish. Combine milk and cream in a medium saucepan, add in sugar, maple syrup and salt. Bring mixture to a simmer, stirring to dissolve the sugar. Place egg yolks in a large bowl and whisk to combine. Whisking constantly, very slowly stream in the hot milk mixture to temper the eggs. Whisk in vanilla extract, then strain mixture into a large measuring cup or a bowl with a pouring spout. Divide mixture evenly into prepared ramekins. Place pan onto a rack in the oven, and pour hot water into the pan around the ramekins so that water comes halfway up the sides of the ramekins. Bake for 30-35 minutes, until custards are set. A very sharp knife inserted into the center of a custard should come out clean. Carefully remove tray from oven and use tongs to lift ramekins carefully out of the water bath and onto a cooling rack.Â Cool to room temperature before refrigerating, then cover with plastic wrap and chill completely before adding topping. For topping: Add about 2 teaspoons of sugar onto the top of each custard and turn the ramekin to spread the sugar into an even layer on top of the custard. Using a kitchen torch and moving it slowly, but constantly, caramelize the topping. Topping can also be caramelized by placing the ramekin under a hot broiler for 1-2 minutes. YUM! 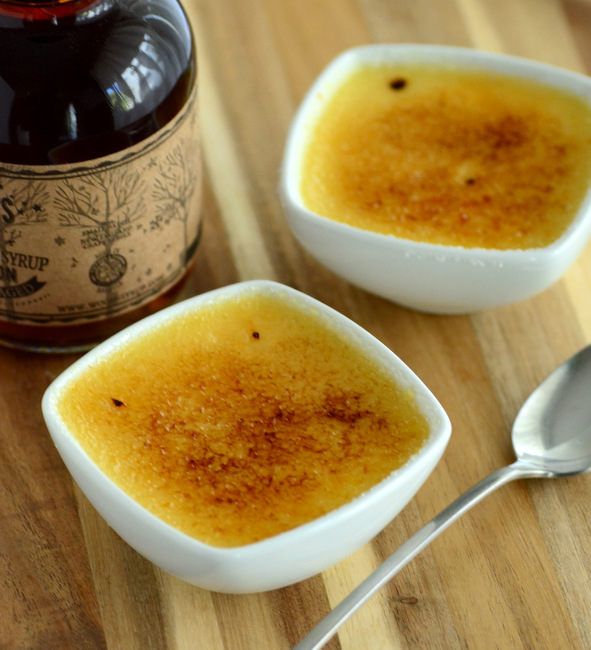 This creme brulee looks delicious and I love the idea of adding maple to it. Ooh okay, this doesn’t actually sound all that hard! I have a dinner party coming up shortly and was worrying about what to do for pudding – perhaps I’ll give these a go!